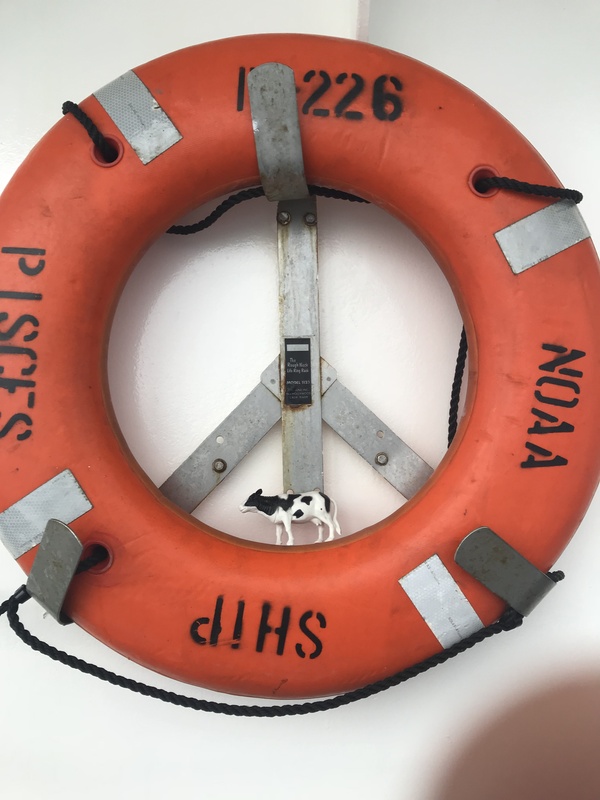 Safety is very important on NOAA vessels. We did various safety drills while I was on board. We did a fire drill and a man overboard drill. We also did an abandon ship drill where we reported to our assigned lifeboats. During one of these drills, I was required to put on a “Gumby” suit. This survival suit is designed to keep you from getting hypothermia if you are to be in the water for long periods of time. For another drill, I donned a blindfold and found my way out my room and to the outside deck. This drill was to simulate an emergency situation with no lights. It was pretty scary to walk through the boat in the dark. The final day of fishing and camera drops proved to be awesome. We had lots of fish on camera and caught fish all four times we dropped lines. 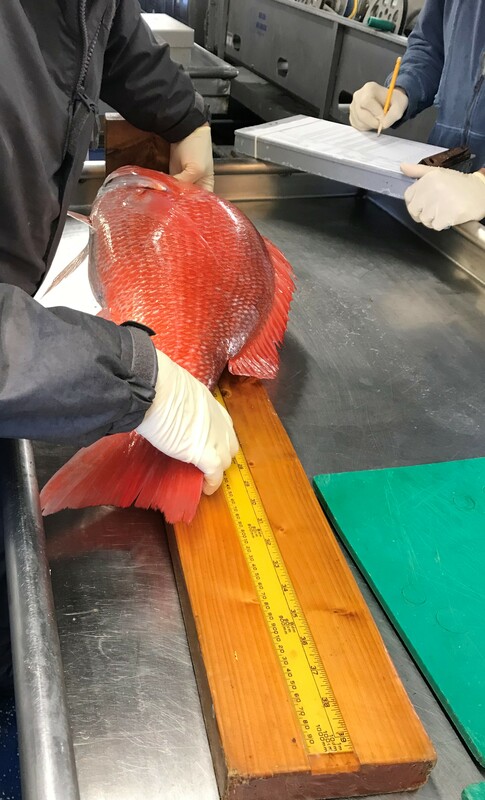 I was able to collect the measurements and samples from those fish without any extra guidance. The mission scientist recorded and observed, but they didn’t have to assist me. Their confidence in me was a pretty great feeling. The video below is an example of the videos collected by both SatCam and RIOT Cam. These arrays have 6 cameras. The video is the view from these cameras stitched together. The top camera is not included in the panorama. The NOAA scientists use the videos to count fish species they study during the SEAMAP reef fish survey. As we were docking, I had mixed emotions as we approached the harbor. I disembarked in Tampa, Florida. I was very excited to get back home but I knew my journey on Pisces was coming to an end. I am proud of myself for taking this trip. I am grateful for all the support from my family, friends, team teachers, and administration. I would not have been able to sail without their help. I learned so much more than I imagined and I will treasure the memories I made on this adventure. 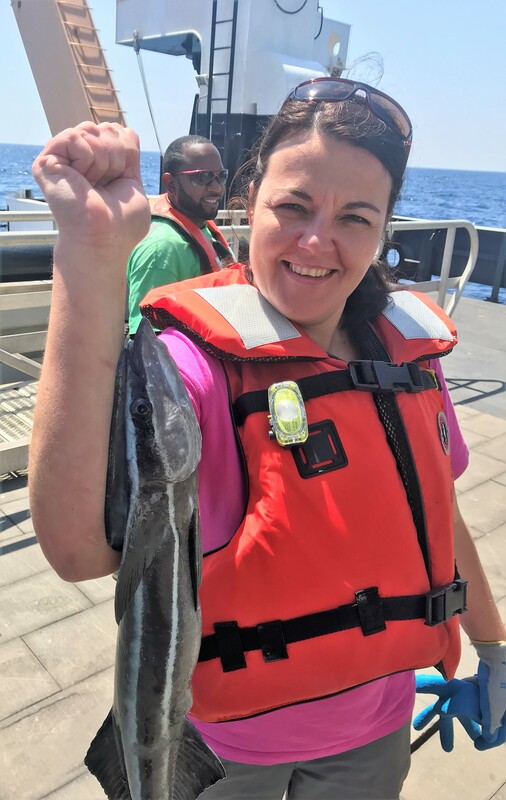 Being a Teacher at Sea increased my appreciation of Gulf of Mexico and I want to pass that on to my students. Life at home has returned to normal. I returned back to school this week. I’ve spent a lot of time talking to my students about my experience aboard the ship. They have asked tons of questions. They are very interested in every aspect of my time at sea and loved all of the pictures and videos. I love that they are so engaged in the lessons this week. We are in the last month of school and it is often hard to keep the student’s attention. My Teacher at Sea tales and lesson plans have kept them focused and on task. They claim to have missed me and I, of course, missed them. I do have a few pieces of advice for the others that have yet to embark on their Teacher at Sea journey. It is amazing. You will love it. Bring a water bottle and a backpack. I used both of these almost constantly. Talk to everyone on the ship. Every member of the vessel has valuable knowledge. Ask your students what they are the most curious about. After a brief overview of NOAA and the mission I was going on, I had my students write questions for me to get answered. It was a great way to gauge what they were most interested in and these also make great conversation starters. If there are not enough male grouper in a given area, the largest or dominant female will change from a female to male. While I have been at sea, I have spent time exploring Pisces and getting to know the people on board. This research vessel is 209 feet long, 50 feet wide, and it has a draft of 20 feet. It is large enough to hold 39 passengers. The crew of the vessel during my sail consists of 5 NOAA Officers, 5 deck crew, 5 engineers, 4 technicians, 2 stewards and 5 scientists. Pisces is loaded with science equipment. It has the capability to run acoustic surveys, marine mammal surveys, and various fish surveys. The onboard wet lab is used to process the marine life brought in on trawls, long lines, or bandit reels. In the dry lab, the mission data is stored and processed by the scientists and survey technicians on the ship. There is a side sample station on the starboard deck where the cameras and ROVs are launched and the trawls are deployed on its stern. The centerboard, on the hull underneath the ship, has mounted sensors that send back various types of data for the scientist to use. This vessel was also engineered to be quiet while underway so it won’t scare marine life. The ship shares the oceanographic, hydrographic and weather data it gathers daily to the outside world. The Commanding Officer gave me a tour of the bridge. The bridge is the navigation center. The vessel can be operated from one of four different stations. The science that is being conducted determines where the officer will navigate from. The technology on the bridge is quite amazing. The dynamic positioning system allows the vessel to stay within certain parameters when supporting science missions. It functions almost like an auto-pilot to keep the ship in the proper position. Most of the days pass quickly and I lose track of time. I can’t believe I have been at sea for 10 days. Having a different type of workday is very unusual to me. I have taught for almost 18 years so school days are what I know. It is different to work with adults all day instead of children. It is a definite change of pace. Today is a slow day. We are currently standing-by due to a weather delay. We have moved closer to shore and are riding out the storm. Hopefully, we will be able to be back up and running tomorrow. I will surely miss the trips to the galley when I get home. I have probably gained five pounds on this trip. The stewards that cook on this ship do an amazing job. It is nice to have already prepared meals. I have gotten spoiled by not cooking too. I know will miss the view when I get back to land. Watching the waves never gets old. I could stare at the water all day. Even when it is stormy the ocean is beautiful. Being away from home is hard. It’s difficult not to harass my team teachers about my classroom while I am gone. I know that my students are well taken care of but it is hard not to worry. The letters from my students, emails from family, texts from my husband, messages from friends, and sweet videos from my granddaughter help me combat homesickness. How many species of sharks are in the gulf? There are approximately 49 shark species in the gulf. This week I have learned a lot about the reef fish studied in this SEAMAP survey. I have learned how to weigh the fish and take various length measurements. I have also learned how to examine the gonads and distinguish a male from a female. I can now properly remove the otolith bones from the otic capsule that is located at the base of the fish’s skull. Dana measures the length of a fish. Dana weighs a fish gonad on a hanging scale. Dana removes an otolith from the fish. We have had some unusual catches that have provided great learning experiences as well. The bandit reel caught a sharksucker on the line as it returned. This fish belongs to the Remora family. It attaches to sharks and other marine animals. This was a really unusual creature to observe. TAS Dana Kosztur displays a sharksucker captured on the bandit reel. The camera arrays had fireworms hitch a ride to the deck from the bottom of the gulf. 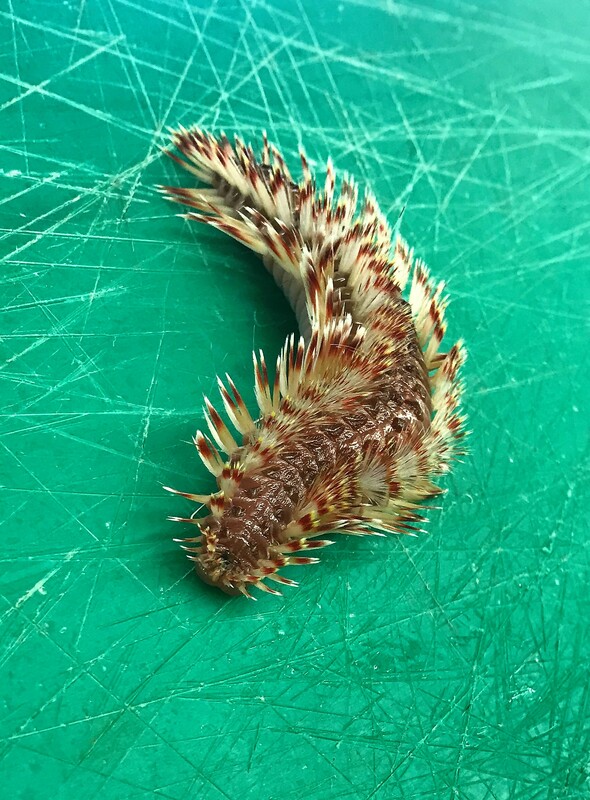 These guys look like large spikey caterpillars. They have venom in their bristles that can cause a painful sting. This fireworm hitched a ride on a camera array. Today was a beautiful day. The water is such a beautiful blue. The sky was cloudless last night so I finally got to look at the stars. The night sky seems much more vast and bright away from the light pollution on land. The stars are amazingly bright. I am enjoying life on the ship but I do miss home. I have a greater respect for those that work away from home for long periods of time. 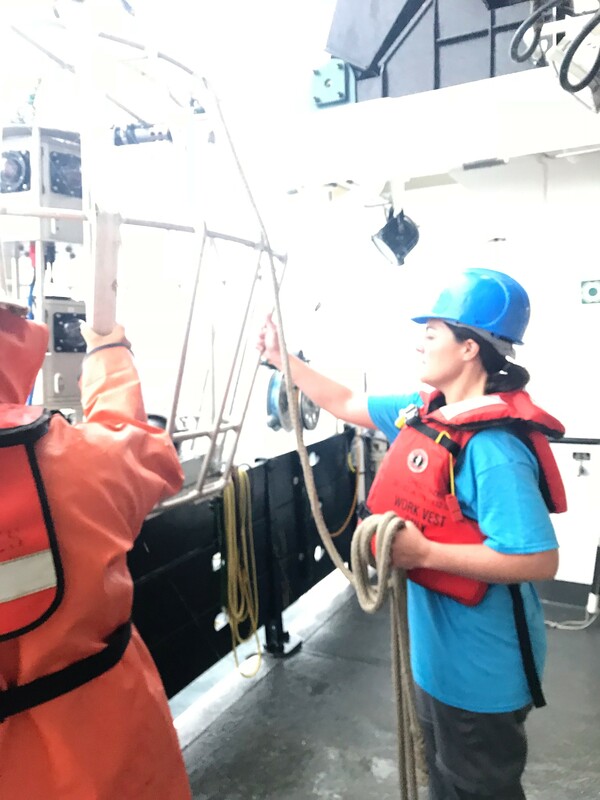 Teamwork and a positive attitude seem to be the lifeblood of this NOAA vessel and that makes it much easier to adjust. 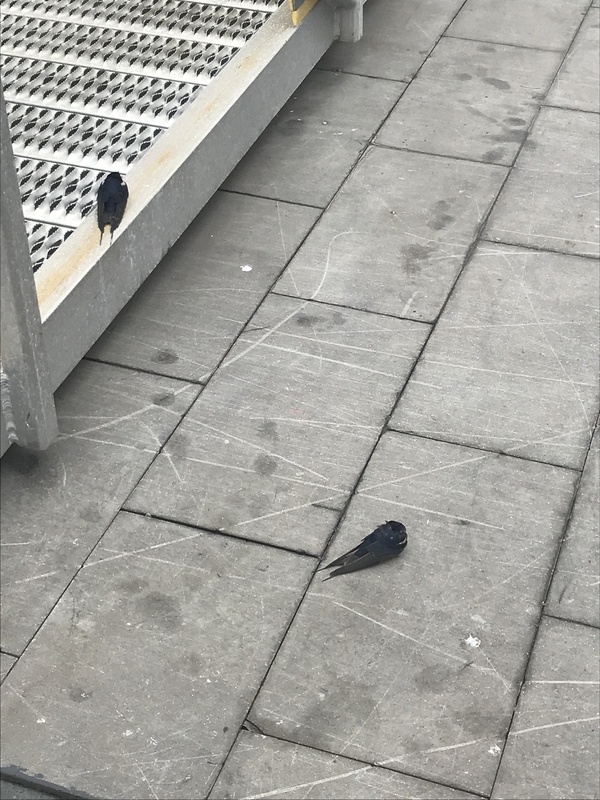 Many birds will often land on the vessel to rest during their migration route across the Gulf of Mexico. Waves transmit energy, not water. Why do scientists need to know what types of fish are on the reef? It is important to manage and maintain the reef fish species because they are often over-fished. The most important equipment on this mission are the camera arrays. Most of the data collected are dependent on these cameras. I mentioned in my last entry the two types of camera arrays used in this survey are the SatCam and the RIOT. The video taken from these camera arrays is stitched together in a five-panel single view. The videos are reviewed and each species that appears is counted and recorded. Images help the scientist determine the population of fish at a given site. The RIOT is a two-stacked spherical camera housing unit that contains 5 horizontal cameras and one upward facing camera. The RIOT is the more expensive of the two arrays, but it gives the scientist a greater ability to measure fish when they are captured in the dual videos. Over the past few days, we have caught several species of fish on the bandit reels. We have caught red snapper, vermilion snapper, and red porgy. These lines have 10 baited hooks and they are dropped into the water on a randomly selected site. In order to obtain a proper sample of the fish, very little human interaction is made with the reel or the line. This leaves out any fisherman bias and allows for natural sampling of species on the site. The hook sizes are rotated with each drop. The hooks sizes are 8, 11, and 15. If reel 1 starts with size 8 hook, it will have size 11 on the next drop, and then 15 on the third. Each reel has a different rotating pattern. This allows each hook size to be in the water over the same site. The data will help determine if a certain hook type is favored by a species of fish. My students will return to school tomorrow from spring break. I am a little sad I am not there with them. They wrote letters for me to read while I was away. I have read some of these already and they are pretty funny. I want to reassure them that I will not fall overboard and that I am eating well. I will answer student questions on the bottom of my blogs. We are in the Gulf of Mexico about 70 to 80 miles offshore, on the Mississippi-Alabama Continental shelf. I have not been this far out in the gulf before today. It is pretty humbling to look out and just see blue water. The sunrises and sunsets are spectacular. You can’t always see them though. The weather has been pretty gloomy the last two days, so I was unable to see last night’s sunset or this morning’s sunrise. We had a storm yesterday followed by the much cooler weather today. I hope this is the only cold snap we get. I am not a fan of cold boat work. Turbidity is how cloudy the water is based on the suspended solids. The higher the turbidity the more sediment, algae and other solids are suspended in the water. Clear water has low turbidity. What is hydrography? The science that measures and describes the physical features of bodies of water and land close to these bodies of water. Multibeam echosounders are used to obtain hydrographic data. I have been aboard Pisces for over 24 hours. I have learned a lot about the technology used on the ship. This vessel has a Simrad ME70 multibeam echo sounder. 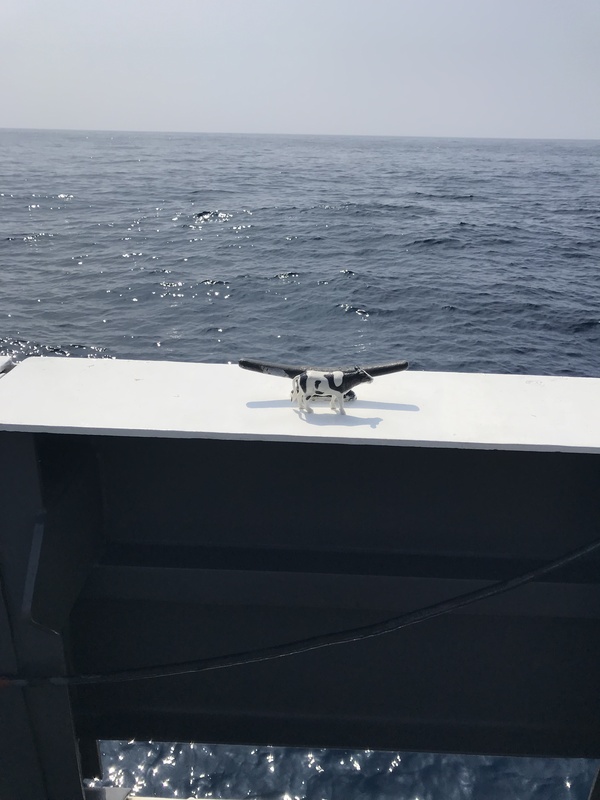 This device will create a bathymetric map of the survey areas that have been randomly selected for this mission. The crew is on the third leg of a four leg reef fish survey. This SEAMAP survey will use cameras as its primary instrument to study the population of fish in the survey area. There are two types of camera arrays the scientist use. The SatCam has 7 cameras that allow a 360-degree view of the ocean floor. The RIOT is a double-stacked version with 12 cameras. The RIOT allows the same visuals as the SatCam but can also be used for fish measurement. The SatCam and RIOT are rotated, one is deployed each site. The boat is positioned over the sampling site and the cameras are released into the water. The cameras free fall to the bottom and are buoyed. They are left to soak for 30 minutes before they are picked back up. The camera begins recording 5 minutes after it hits the bottom to allow the sediment to settle, it then records for the remaining 25 minutes. After the camera is sent into the water, the ship moves away and a CTD is released into the water in much the same way. The CTD is an electronic instrument package that sends back real-time data of water conditions such as salinity, temperature, density, and light filtration versus water depth. Bandit reels are also used in this survey. There are three of these reels mounted on the starboard side of the boat. The line on each has 10 baited hooks. This leg of the trip we are only fishing every other stop. The first round of fishing with the bandit reels yielded no fish. The second time the stern bandit reel caught silky sharks. Three sharks made it to the deck to be weighed, measured and then safely released. The next time we used the reels two large red snappers were caught. They were weighed and measured. The otoliths and gonads were removed from each specimen. These will be used to determine age and reproductive abilities. I think I am getting adjusted to life aboard the ship. We are only working during daylight hours so I won’t have to change my sleeping schedule. I am working with a team of 4 scientists and they are doing a great job explaining everything and answering my questions. There is so much to learn about and I want to know it all. I am taking medication to keep from getting seasick and it is working, but I was so exhausted yesterday that I went to bed after watching the sunset. I hope that will get better in the coming days. I haven’t lost my excitement about being here. Everything out here is interesting. A snapper otolith can tell the age of the fish. The otolith is an ear bone. 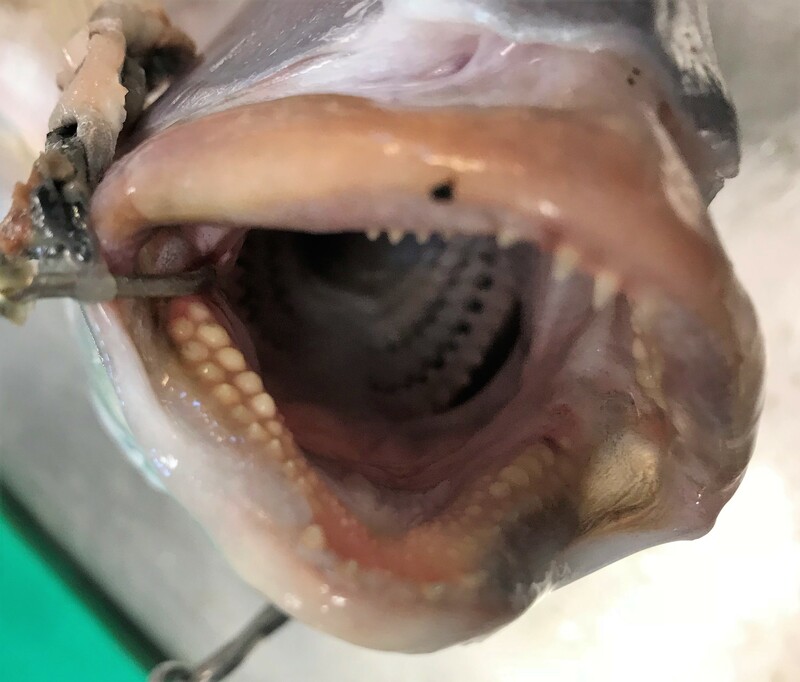 When removed from the fish and cut in half, the rings can be counted.